The monster cereals are back in full force at this time of the year. You can see them here and there during the year but they really get a boost during the holiday season. You especially see more of Boo-Berry during this time of year. I’ve loved these cereals, mostly Franken-Berry, since I was a kid. Does anyone remember the two other flavors that were discontinued? Both flavors of cereal had multiple fruits in it, much like Fruity Pebbles. One was a werewolf and one was a mummy. Give up? Well the werewolf was Fruit Brute and the mummy was Fruity Yummy Mummy. 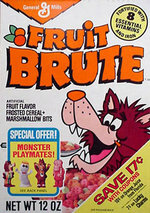 The only difference between the two was that Fruit Brute had lime marshmallows and Yummy Mummy had vanilla marshmallows. I think Fruit Brute was replaced by Yummy Mummy because the werewolf was considered too scary. Aren’t they SUPPOSED to be scary? They are monster cereals. This isn’t really Halloween themed, but I found it with the Halloween candy so I’m including it. 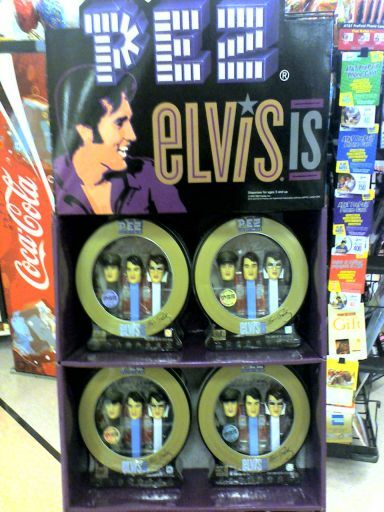 It’s a gift pack of Elvis Presley Pez dispensers. You get three different Elvis heads; Army Elvis, ’68 Special Elvis and Vegas Elvis. Very cool packaging and display. I approve. 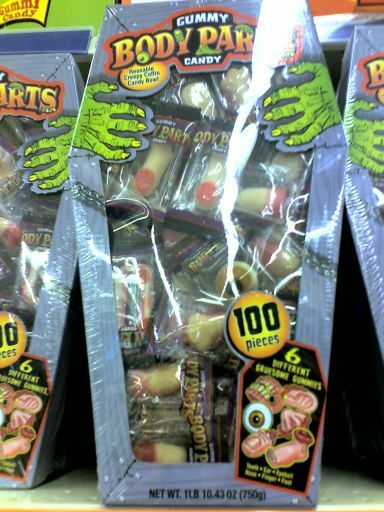 I want to go ahead and vote these the WORST candies in the history of Halloween. For me, there was nothing more dreaded than seeing someone reach into a bowl of generic orange and black wrappers and dump a fistful of this crap into my bag. The look on my face would have been the same had you dropped a trial-sized package of floss or a severed head into my treat bag. I was appalled and horrified. I wanted to slap this person and challenge them to a duel with pistols at dawn. Awful, generic tasting, bland peanut butter chews of death. 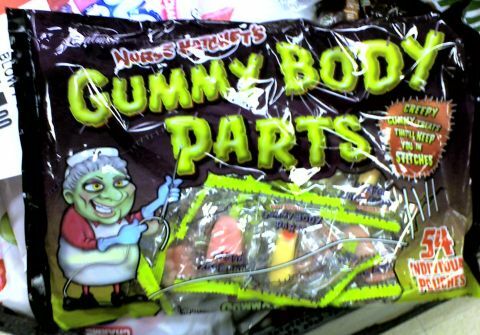 That’s this candy’s new name. You may disagree, but you’d be wrong. One of my favorite blogs, Branded in the 80s, found this nugget of black and orange gold. I have never seen this before. 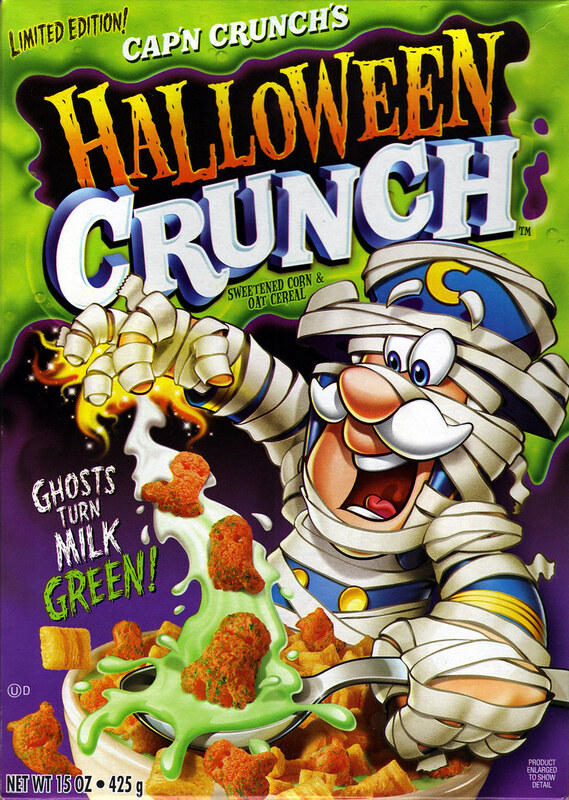 I knew Cap’n Crunch released a Christmas Crunch every year during the holiday season but this is more than awesome, it’s uber-awesome. I’ve scoured the stores looking for this but have yet to find it. I fear that my time is almost up. How mecha-awesome do these Ghost Dots look? I first saw these on X-Entertainment’s Halloween Countdown but they turned up again on Branded in the 80s (in the same article as the above super cereal). 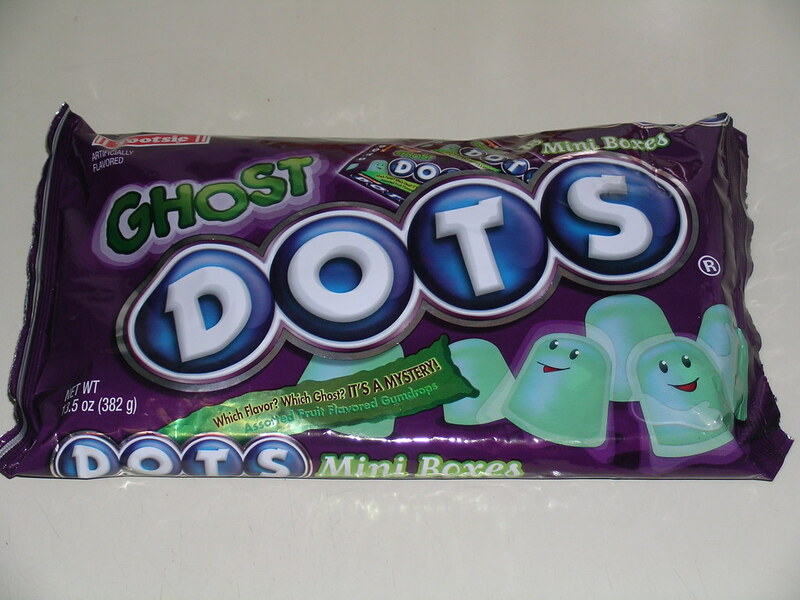 I love regular Dots, but the idea that these dots are mystery flavored is just too much to take. SO. F’N. AWESOME. 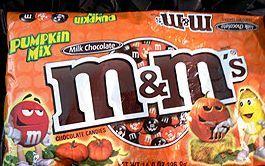 I have to find these things before Halloween is over. I saw a cool article on Wired asking people to send in some of their best carved pumpkins. 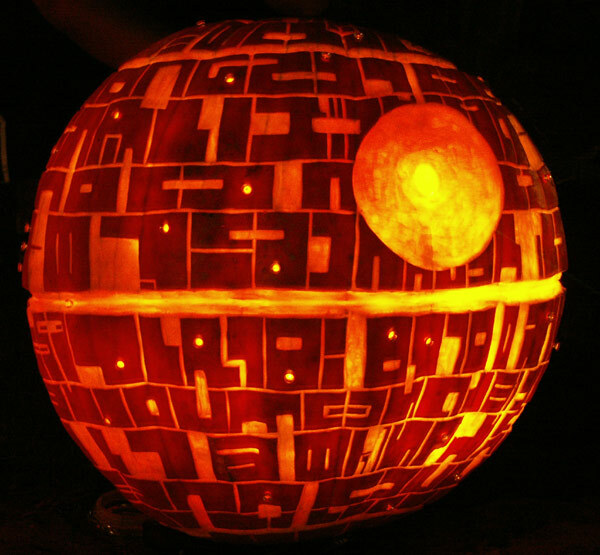 They call it Show Us Your Geeky Jack-o-Lanterns. Here are some of the best. You can click the pics to go to the article for the full size picture. So there’s my roundup of all things Halloween. It really creeped up on me this year (pun intended). I had at least one other article planned but had to scrap it at the last moment. This entry was posted on October 31, 2007 at 6:18 pm and is filed under candy, Elvis, Halloween with tags AWESOME-tober-fest, AWESOME-tober-fest 2007, candy, Elvis Presley, Halloween, holiday, pop culture. You can follow any responses to this entry through the RSS 2.0 feed. You can leave a response, or trackback from your own site. 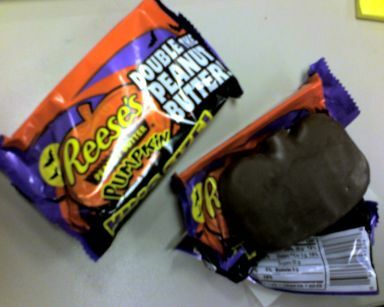 “Awful, generic tasting, bland peanut butter chews of death” DITTO. DITTO. DITTO. I can’t believe those things are still made. Does anyone even EAT them? They are given out by witchy children-haters to torture little kids. I’ve always hated those things too, yuck! My Meme used to get them every year because for some odd reason she actually LIKED them! 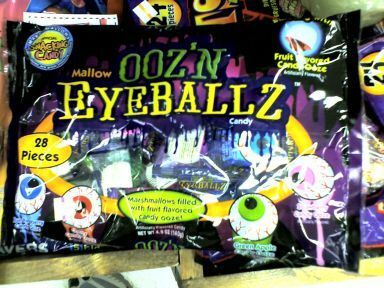 Which in turn meant that I would have a ton of them on Halloween every year. Can you believe I didn’t get a pumpkin this year? I just haven’t been in a real Halloweeny mood lately. I think it’s because southern Mississippi doesn’t really do Halloween that much which I really makes me wanna go back to Georgia! Thanks for the blog link to Branded in the 80’s! It looks like a fun blog. Thanks. I’m sure you would like Branded by the 80s. Steph and I haven’t been in a very Halloween-y mood this year either. Don’t know what it is. Maybe the Xmas season will be better. Too hilarious! You know, I didn’t think they made Frankenberry & Booberry cereals at all anymore. Maybe I’ll be able to find them in the grocery store this week. Does ANYONE like those Mary Jane peanut butter chews??? Those are disgusting. The only candy I dislike more are the fake milk chocolate coins. During Halloween they get the pumpkin on the foil wrappers, and Easter brings the little foil wrapped eggs, but that makes them no more appetizing. Is chocolate really so expensive that companies have to make a waxy substitute? (shiver) Just thinking about those things gives me the heebie jeebies! 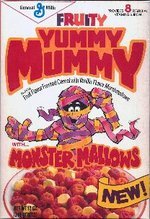 “Fruity Yummy Mummy makes my tummy go yummy!” That was the tag line for that cereal. And I believe Fruit Brute came and went in the seventies, and Fruity Yummy Mummy came and went in the eighties. I also think it’s quite funny to see “Save 17 cents with coupons” on that Fruit Brute box.